Patent Trial and Appeal Board (PTAB) Defended by Technology Giants, by Small Companies, by US Congress and by Judges, So Why Does USPTO Make It Less Accessible? Yesterday, we submitted a letter for the record to the House Judiciary Committee Subcommittee On Courts, Intellectual Property and the Internet. This letter, written in response to testimony submitted for the Subcommittee’s hearing on Sovereign Immunity and IP, provides the details of our analysis of the patents which Josh Malone and Phil Johnson identified as showing a disagreement on validity between the PTAB and federal courts. In contrast to their allegation of 200 patents, the real figure is far lower. Of the 3,056 patents reviewed by the PTAB which were also at issue in litigation in federal district courts, there are 43 cases (just over 1%) in which the PTAB and a district court have disagreed with one another. The data, when correctly understood, shows that the PTAB only rarely disagrees with the federal courts when both review the validity of the same patent. The data also shows that the two venues only rarely review the validity of the same patent. We believe the Subcommittee’s work will benefit from this understanding of the extreme infrequency with which the PTAB and a district court reach different conclusions. Additionally, based on information that William New wrote about, “US Congress Members Signal Move To Block Allergan Patent Deal With Tribe” (Mohawk). Members of a US congressional subcommittee on intellectual property held a hearing last week that appeared aimed at finding ways to stop companies from “renting” the sovereignty of Native American tribes in order to avoid a process that can lead to the invalidation of patents. Elected officials called a deal between Allergan pharmaceutical company and a northeastern tribe a “sham” and a “mockery”, and signalled the start of the legislative procedure to prevent such deals. Notice the use of the words “sham” and “mockery”. There’s also “scam” — a popular term in various blogs and comments. A Federal judge called it a “sham”. One might expect the USPTO to heed the warning and make PTAB even stronger, but instead, based on this post from Patently-O and another one from New’s publication, the USPTO reduces access to PTAB by means of fee hikes. The United States Patent and Trademark Office (USPTO) today issued changes to some patent fees, including increases in certain areas, including the cost of using the inter partes review process. Following feedback from users, the office went with some proposed increases, while keeping others at existing levels despite proposals to increase them, it said. WASHINGTON – The U.S. Department of Commerce’s United States Patent and Trademark Office (USPTO) today issued a final rule, “Setting and Adjusting Patent Fees during Fiscal Year 2017” to set or adjust certain patent fees, as authorized by the Leahy-Smith America Invents Act (AIA). The revised fee schedule is projected to recover the aggregate estimated cost of the USPTO’s patent operations, Patent Trial and Appeal Board (PTAB) operations, and administrative services. The additional fee collections will support the USPTO’s progress toward its strategic goals like pendency and backlog reduction, patent quality enhancements, technology modernization, staffing optimization, and financial sustainability. PTAB is important and the cost of petition matters, especially to small companies which are being targeted by trolls and have limited budget. PTAB defends them from patent trolls and software patents without having to go through courts and appeals, which can add up to hundreds of thousands if not over a million dollars in fees (no matter the outcome). IAM says that according to Google’s Suzanne Michel, “from [a] tech perspective IPRs have been very effective at reducing a lot of litigation” (direct quote from IAM but not Suzanne Michel). She is right. 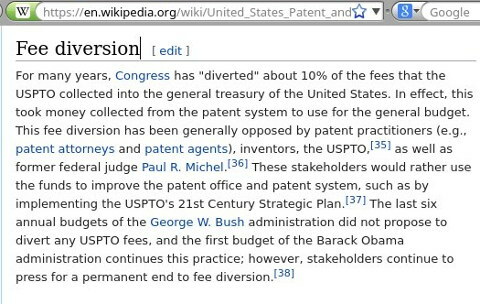 Hence our stubborn defense of PTAB. Yesterday, IAM noted or highlighted yet another case of PTAB being used to thwart dubious patents, even if the petitioner is a large company (PTAB bashers like to obsess over such points). The world’s largest oil and gas company Saudi Aramco has filed an inter partes review (IPR) against a Korean petrochemical business in what is a highly unusual move by one of the energy majors. The Saudi national oil giant, which produces 12.5 million barrels per day, has brought the IPR against SK Innovation, which started life as the Korea Oil Company before morphing into a broad-based energy and chemicals business. The patent in question, number 9,023,979, relates to a method of preparing epoxide/CO2 polycarbonates and was issued in 2015. It’s not clear what has prompted the review – there is no ongoing patent litigation between the two companies, which might mean that it is related to licensing negotiations that have broken down and Saudi Aramco has brought the IPR in order to gain some leverage in the talks. Halliburton is among the most active of these, with 36 IPRs including 32 this year, mostly against its rival Schlumberger. Baker Hughes meanwhile has been involved in 27 IPRs either as petitioner or patent owner.